Equipping staff with the right tools can enhance productivity, motivation and staff retention. Highly secure mobile email and data applications help mobile workers stay in touch and up-to-date with a wide range of business issues. Extending that streamlined anytime, anywhere access to mobile voice applications is the next frontier in worker empowerment. 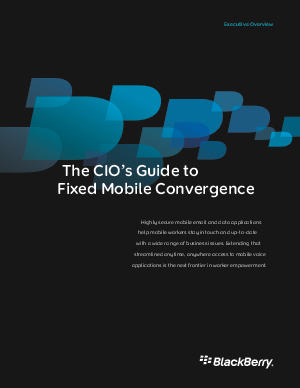 Organizations seeking solutions that provide high-performance access while addressing security needs can leverage fixed mobile convergence (FMC) systems to enhance communication. This document explores why your organization should implement an FMC solution, the benefits of FMC and considerations for methods of implementation.